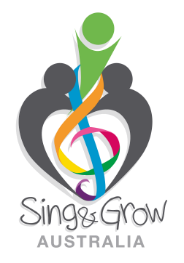 With 57 standard programs, 22 workshops and 7 Community Placements conducted across Terms 1 and 2 this year, Sing&Grow remained busy providing services to 927 families across Australia, encompassing 1064 adults and 1285 children. An additional 216 staff and volunteers from host organisations gained a greater understanding of music use with children and their families through their attendance in sessions also. Satisfaction rates continue to be high with 100% of families satisfied with staff and 99.2% satisfied with the program. 98.4% would recommend Sing&Grow to other parents, and 95.3% would attend the program again if offered the opportunity. In addition, 100% of staff who returned surveys would recommend Sing&Grow to other organisations, and 96% believed it was accessible for all the families. Data Collection: Sing Grow is participating in a FaHCSIA trial of a central database for all Family Support Program services. Instead of providing 6-monthly reports, all our data is entered into this database for collation. Our involvement in this trial has meant a small increase in the data we need to collect and requires us to gain consent from families for their data entered into the database, but so far we have had a high consent rate as all data is de-identified once entered into the system. The trial is not without its hitches, but the potential benefits to us are high. All the data entered will always be readily available to Sing&Grow, with the hard work of collating the information already done for us! We are excited about the potential of this database and how the data collated may help inform our work, therefore improving our service to the families we see.